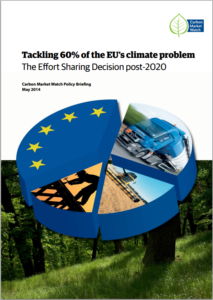 The Effort Sharing Decision (ESD) covers 60% of EU’s total greenhouse gas emissions and is therefore a centrepiece of Europe’s climate legislation. In contrast to the EU’s Emissions Trading Scheme (ETS) which started in 2005, the implementation of the ESD only began in 2013. Therefore, little is known about how successful it has been tackling the sectors not covered by the ETS. The Effort Sharing Decision establishes linear trajectory of binding emission limits for each Member State for the 2013-2020 period and its governance structure is based on annual compliance. According to the first progress reports from the European Environmental Agency (EEA) (2013), the ESD targets will be overachieved by up to 50% of the effort required. The majority of Member States have therefore not planned significant additional measures to reduce emissions beyond those that already exist. Similar to the ETS, the ESD also offers flexibilities and trading options to make it cheaper to comply with the targets. For example, more than 50% of reduction efforts can be achieved by using international offsets. Member States have to submit reports on the amount of offsets and other trading options used in 2013 by January 2016. The current targets, combined with the overgenerous flexibilities, are clearly too weak to drive emission reductions and delay the implementation of necessary policies for a decade. It is hence no surprise that a surplus is expected to accumulate in the ESD equal to almost 600 million tons of CO2-eq by 2020. Given the importance of reducing emissions in the non-ETS sectors, such as transport, agriculture and buildings, the lessons learnt with the implementation of the ESD can provide valuable information for European policymakers for their deliberations regarding the 2030 policy framework for climate and energy. Strengthen the current governance structure keeping binding emission limits and the binding annual compliance for each Member States . Significantly increase the target to at least 45% emission reductions below 2005 levels by 2030 to fully exploit the cost-effective potential and drive actual emission reductions. Do not allow the carry-over of any surplus into the post-2020 period. Keep the land use, land-use change and forestry (LULUCF) sector separate from the Effort Sharing Decision and the ETS, without any flexibility options between the different pillars. Maintain policies at Union level that contribute to achieving reductions in the non-ETS sectors inter alia as regards transport and buildings, e.g. ensure the continuation of the Fuel Quality Directive and establish binding energy efficiency targets. Exclude international offsets to meet the 2030 climate obligations. Improve the intra-EU flexibilities by establishing harmonized modalities for transactions between Member States to unlock mitigation potential in poorer Member States, e.g. via domestic offsetting within the ESD.